Very useful as ground cover plants, and also small shrubs Cuphea are a varied genus with species suited to a range of climates. 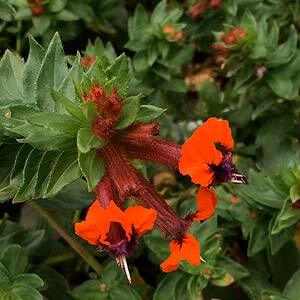 One of the more popular species is Cuphea ignea or ‘Firecracker Plant’ brilliant red flowers against green foliage. The flowers in the shape of cigars and red like firecrackers. Wholesale growers offer a very wide range of plants, with a few specialist growers in Australia heavily involved in hybridisation. What are commonly called ‘Bat Faced Cuphea’ include cultivars such as ‘Tiny Mice’ with its unusual red and purple flowers, pictured right. These make a colourful summer bedding plants, excellent in the border, containers or even hanging baskets. Cultivars range from low growing types such as ‘Little Hatter’ which has attractive mauve flowers, will reach around 30cm in height, to taller growing varieties that will reach 60cm in height. Most species need protection from frost. C. hyssopifolia – Also known as ‘False Heather’, white or purple flowers on a small shrub. The varieties offered by wholesalers are mainly hybrids, White, Mauve or Pink flowers on more compact bushy shrubs.